3 (13) On the highway side of any vehicle stopped or parked at the edge or curb of a street; (14) Upon any bridge or other elevated structure upon a highway, or within a highway tunnel or underpass, or on the immediate approaches thereto except where space for parking is provided; (15) In a space on public or private property appropriately marked for vehicles for the physically handicapped pursuant to 39: , 52:27D-119 et seq. or any other applicable law unless the vehicle is authorized by law to be parked there and a handicapped person is either the driver or a passenger in that vehicle. 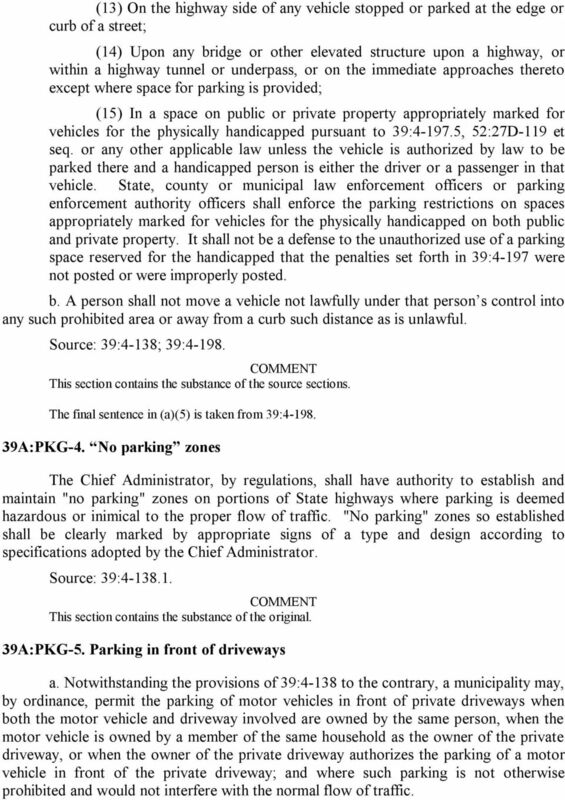 State, county or municipal law enforcement officers or parking enforcement authority officers shall enforce the parking restrictions on spaces appropriately marked for vehicles for the physically handicapped on both public and private property. It shall not be a defense to the unauthorized use of a parking space reserved for the handicapped that the penalties set forth in 39:4-197 were not posted or were improperly posted. b. A person shall not move a vehicle not lawfully under that person s control into any such prohibited area or away from a curb such distance as is unlawful. Source: 39:4-138; 39: This section contains the substance of the source sections. The final sentence in (a)(5) is taken from 39: A:PKG-4. No parking zones The Chief Administrator, by regulations, shall have authority to establish and maintain "no parking" zones on portions of State highways where parking is deemed hazardous or inimical to the proper flow of traffic. "No parking" zones so established shall be clearly marked by appropriate signs of a type and design according to specifications adopted by the Chief Administrator. Source: 39: A:PKG-5. Parking in front of driveways a. 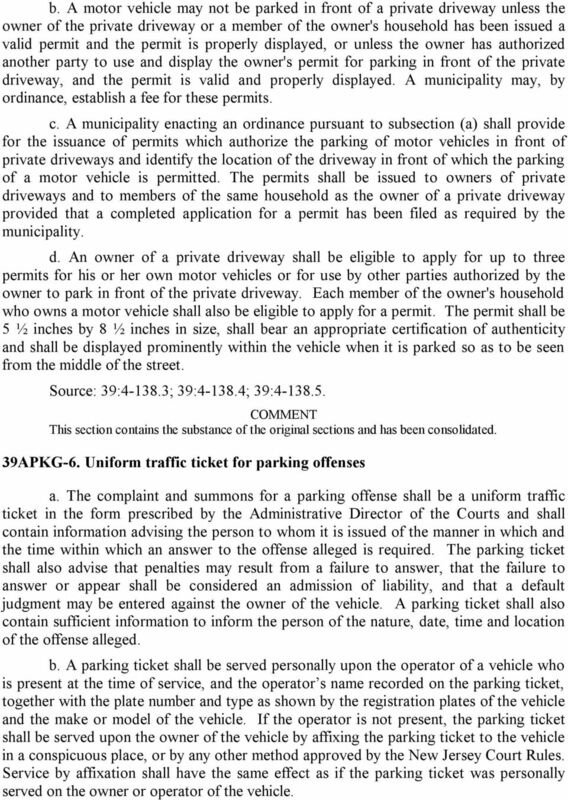 Notwithstanding the provisions of 39:4-138 to the contrary, a municipality may, by ordinance, permit the parking of motor vehicles in front of private driveways when both the motor vehicle and driveway involved are owned by the same person, when the motor vehicle is owned by a member of the same household as the owner of the private driveway, or when the owner of the private driveway authorizes the parking of a motor vehicle in front of the private driveway; and where such parking is not otherwise prohibited and would not interfere with the normal flow of traffic. 4 b. A motor vehicle may not be parked in front of a private driveway unless the owner of the private driveway or a member of the owner's household has been issued a valid permit and the permit is properly displayed, or unless the owner has authorized another party to use and display the owner's permit for parking in front of the private driveway, and the permit is valid and properly displayed. A municipality may, by ordinance, establish a fee for these permits. c. A municipality enacting an ordinance pursuant to subsection (a) shall provide for the issuance of permits which authorize the parking of motor vehicles in front of private driveways and identify the location of the driveway in front of which the parking of a motor vehicle is permitted. The permits shall be issued to owners of private driveways and to members of the same household as the owner of a private driveway provided that a completed application for a permit has been filed as required by the municipality. d. An owner of a private driveway shall be eligible to apply for up to three permits for his or her own motor vehicles or for use by other parties authorized by the owner to park in front of the private driveway. Each member of the owner's household who owns a motor vehicle shall also be eligible to apply for a permit. The permit shall be 5 ½ inches by 8 ½ inches in size, shall bear an appropriate certification of authenticity and shall be displayed prominently within the vehicle when it is parked so as to be seen from the middle of the street. Source: 39: ; 39: ; 39: This section contains the substance of the original sections and has been consolidated. 39APKG-6. Uniform traffic ticket for parking offenses a. 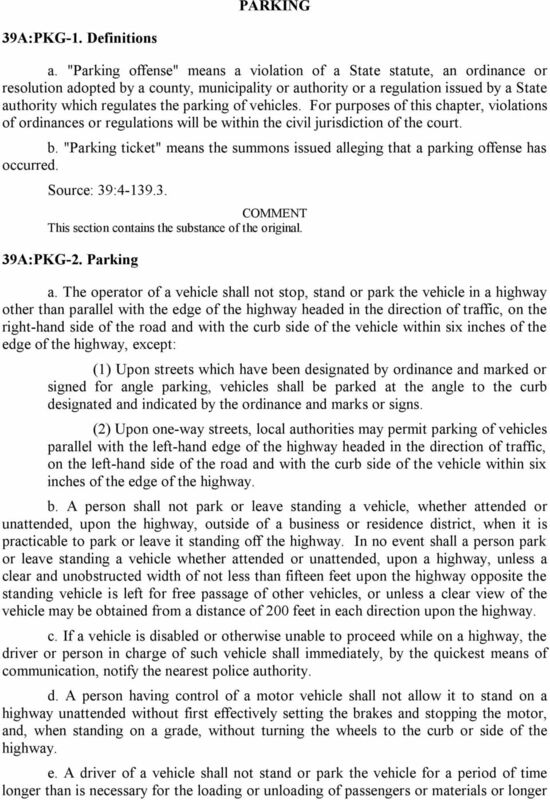 The complaint and summons for a parking offense shall be a uniform traffic ticket in the form prescribed by the Administrative Director of the Courts and shall contain information advising the person to whom it is issued of the manner in which and the time within which an answer to the offense alleged is required. The parking ticket shall also advise that penalties may result from a failure to answer, that the failure to answer or appear shall be considered an admission of liability, and that a default judgment may be entered against the owner of the vehicle. A parking ticket shall also contain sufficient information to inform the person of the nature, date, time and location of the offense alleged. b. A parking ticket shall be served personally upon the operator of a vehicle who is present at the time of service, and the operator s name recorded on the parking ticket, together with the plate number and type as shown by the registration plates of the vehicle and the make or model of the vehicle. 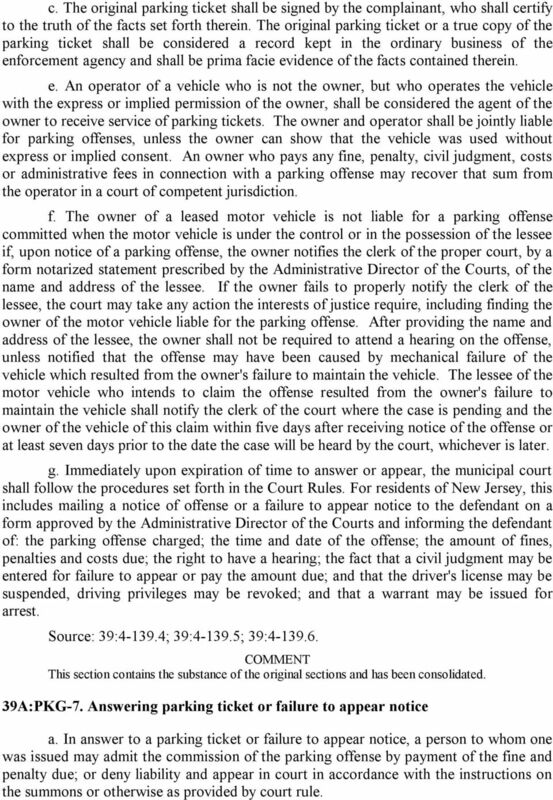 If the operator is not present, the parking ticket shall be served upon the owner of the vehicle by affixing the parking ticket to the vehicle in a conspicuous place, or by any other method approved by the New Jersey Court Rules. Service by affixation shall have the same effect as if the parking ticket was personally served on the owner or operator of the vehicle. 5 c. The original parking ticket shall be signed by the complainant, who shall certify to the truth of the facts set forth therein. The original parking ticket or a true copy of the parking ticket shall be considered a record kept in the ordinary business of the enforcement agency and shall be prima facie evidence of the facts contained therein. e. An operator of a vehicle who is not the owner, but who operates the vehicle with the express or implied permission of the owner, shall be considered the agent of the owner to receive service of parking tickets. 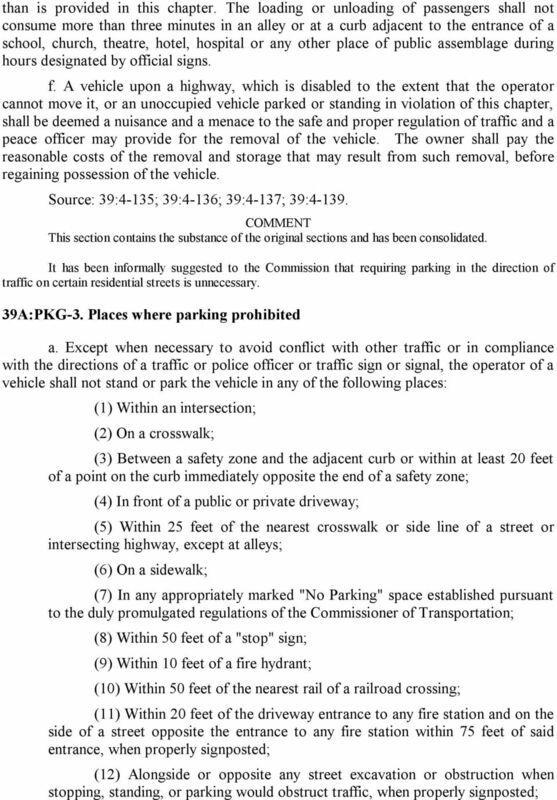 The owner and operator shall be jointly liable for parking offenses, unless the owner can show that the vehicle was used without express or implied consent. 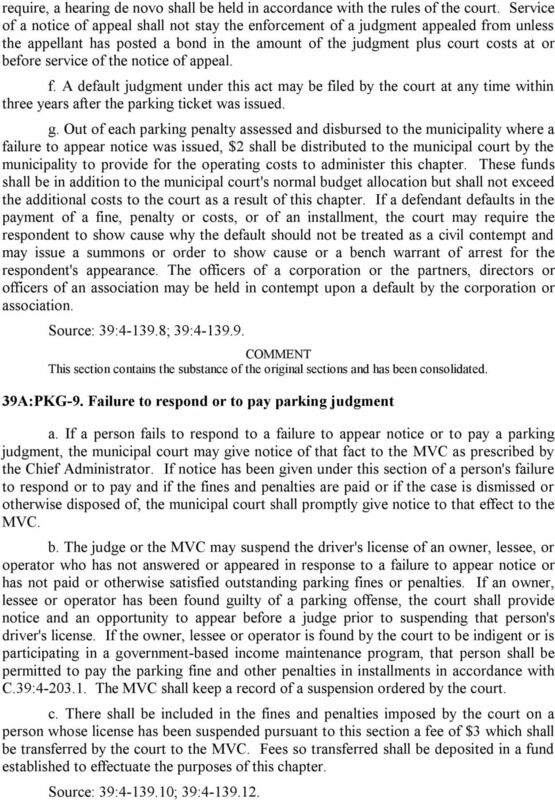 An owner who pays any fine, penalty, civil judgment, costs or administrative fees in connection with a parking offense may recover that sum from the operator in a court of competent jurisdiction. f. The owner of a leased motor vehicle is not liable for a parking offense committed when the motor vehicle is under the control or in the possession of the lessee if, upon notice of a parking offense, the owner notifies the clerk of the proper court, by a form notarized statement prescribed by the Administrative Director of the Courts, of the name and address of the lessee. If the owner fails to properly notify the clerk of the lessee, the court may take any action the interests of justice require, including finding the owner of the motor vehicle liable for the parking offense. After providing the name and address of the lessee, the owner shall not be required to attend a hearing on the offense, unless notified that the offense may have been caused by mechanical failure of the vehicle which resulted from the owner's failure to maintain the vehicle. 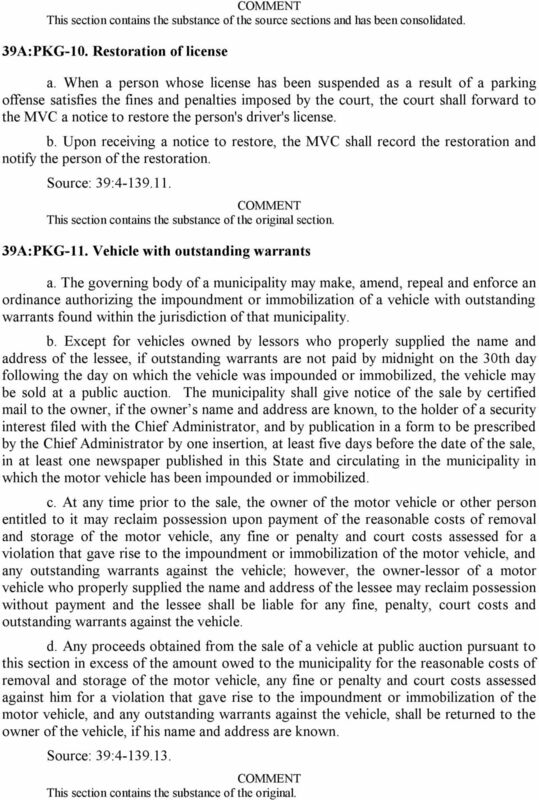 The lessee of the motor vehicle who intends to claim the offense resulted from the owner's failure to maintain the vehicle shall notify the clerk of the court where the case is pending and the owner of the vehicle of this claim within five days after receiving notice of the offense or at least seven days prior to the date the case will be heard by the court, whichever is later. g. Immediately upon expiration of time to answer or appear, the municipal court shall follow the procedures set forth in the Court Rules. 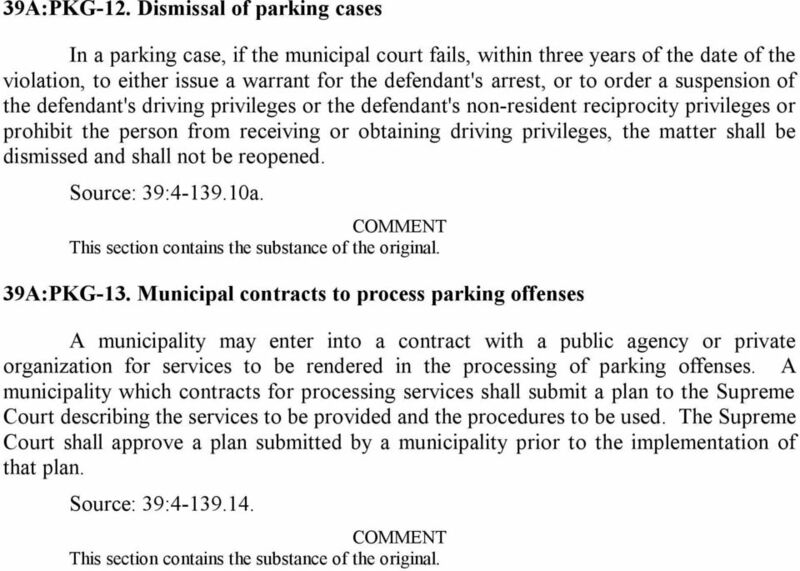 For residents of New Jersey, this includes mailing a notice of offense or a failure to appear notice to the defendant on a form approved by the Administrative Director of the Courts and informing the defendant of: the parking offense charged; the time and date of the offense; the amount of fines, penalties and costs due; the right to have a hearing; the fact that a civil judgment may be entered for failure to appear or pay the amount due; and that the driver's license may be suspended, driving privileges may be revoked; and that a warrant may be issued for arrest. Source: 39: ; 39: ; 39: This section contains the substance of the original sections and has been consolidated. 39A:PKG-7. Answering parking ticket or failure to appear notice a. 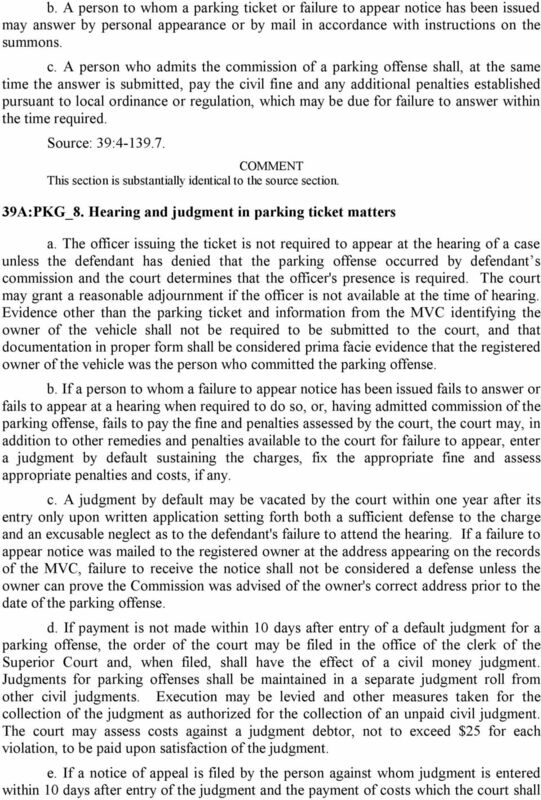 In answer to a parking ticket or failure to appear notice, a person to whom one was issued may admit the commission of the parking offense by payment of the fine and penalty due; or deny liability and appear in court in accordance with the instructions on the summons or otherwise as provided by court rule. Except as expressly provided otherwise, the offenses in this chapter are civil. ALABAMA RULES OF JUDICIAL ADMINISTRATION. Rule 20. History: 1949, Act 300, Eff. Sept. 23, 1949; Am. 1958, Act 35, Eff. Sept. 13, 1958; Am. 2005, Act 3, Imd. Eff. Apr. 1, 2005. Number 21 of 2009 ENFORCEMENT OF COURT ORDERS (AMENDMENT) ACT 2009 ARRANGEMENT OF SECTIONS. 2. Amendment of Enforcement of Court Orders Act 1940. Number 21 of 2009 ENFORCEMENT OF COURT ORDERS (AMENDMENT) ACT 2009 Section 1. Definition. ARRANGEMENT OF SECTIONS 2. Amendment of Enforcement of Court Orders Act 1940. 3. Short title and collective citation. INSPECTION FEES; PROVIDING FOR SEVERABILITY; ALLOWING FOR READING OF THIS ORDINANCE BY TITLE ONLY; AND PROVIDING AN EFFECTIVE DATE.